You arrive at the Nayandahalli bus stop to encounter a swirl of dust and unearthed soil. Standing on the Outer Ring Road, your gaze promptly turns from the construction below to the remarkable Mysore Road flyover, zipping above you without a pause to connect the heart of the city to Ramanagara and Mysore. Right beside is another overpass, this one being the new metro line that is scheduled to connect the Bangalore University area to Vijayanagara, and then onto Majestic, the city’s central transportation hub. One could easily mistake the turbulent waters rushing below, thick in viscosity, striking in its dark greens and iridescent greys, and emitting a deeply pungent aroma, for one of Bangalore’s many open sewers. It is only upon further inquiry that you realize that this is the Vrishabawathi River, a tributary of the Arakavati. A river which, after sustained intake of domestic and industrial waste, has acquired a distinctly man-made quality. Nestled underneath a city consumed by vertical and horizontal growth, Nayandahalli is one of many small towns and gullies that people pass by while traveling on main roads, bridges, and flyovers. One seldom notes their existence; these are places subsumed by greater Bangalore’s growth, appearing awkward and anachronistic in its midst. However, their very existence indicates that they occupy a key strategic position in the city’s developmental aspirations, as areas responsible for managing the tremendous debris produced as a natural consequence of human progress. From the 19th century rubbish heaps north of London described so vividly in Dickens’ Our Mutual Friend,to more recent examples such as the Thilafushi Island in the Maldives or the Zabbaleen settlements in Cairo, communities that extract value from waste have played a crucial role in recycling urban debris into material used for further growth. Their work has often gone unacknowledged, even if their actions have proven politically decisive. The relationship that a society has with its wastes can reveal much about the circumstances of its past and present making, as well as indicate broad outlines of its future direction. Nayandahalli, as one of Bangalore’s main hubs for plastic, metal, paper, and cloth recycling, is one such indicator, a yardstick that epitomizes the relationship Bangalore has with its detritus and with its own material becoming. Tucked away in dusty corners, underneath flyovers and metro rails, it is physical evidence of the strained relationship that a city, in a moment of technophilia, has with the vast matter it leaves behind, substances with dormant value, regularly drawn upon for the continuation of urban life. It is a relationship that subdues communities that engage in waste work, the work of putting materials into reuse, through active forgetting.Over the course of our interviews with various recyclers, I am struck by how sharply this sentiment is articulated by the various waste segregators, haulers, and godown operators. “Land,” says Fatima, “is the most important thing for all of us.” A local activist, she comes from a family of scrap dealers.Her husband, Sameer, drives a truck transporting scrap plastic to and from various godowns across the city. “Nayandahalli is filled with hundreds of godowns that constantly have to move about,” she elaborated, “because in one way or another, we are all renters. Often, our godowns are rented and so are our dwellings.” Fatima explained how, for rentiers, recyclers are never the first priority, especially in the midst of a booming Bangalore property market and rising rent prices. Echoing many others, she cited instances of being chastised by rentiers or neighbors for putting scrap material out in the field for loading, where it was visible for passersby. “Moreover, the haulers and segregators themselves have no place to go back to, they often sleep right in the godown, fearing for their security” she remarked, pointing to the conditions of the workers. Waste work is tolerated only when it is out of sight and out of mind. Sameer and Fatima take us to an open stretch of land underneath the metro station, on the banks of the Vrishabawathi, where around ten godowns are situated. There we meet Ahmed Pasha, a Godown operator who has formed an association with his colleagues to lobby for political and legal recognition. “We were all situated further in the city,” he says, “but when the houses started coming up, it became harder for us to move our materials around.” When we ask who owns the property now, he laughs and points to the tea seller’s shop next to the godown. “We’ll see how long we can stay here”, he remarks, turning his gaze to the unfinished metro line above. 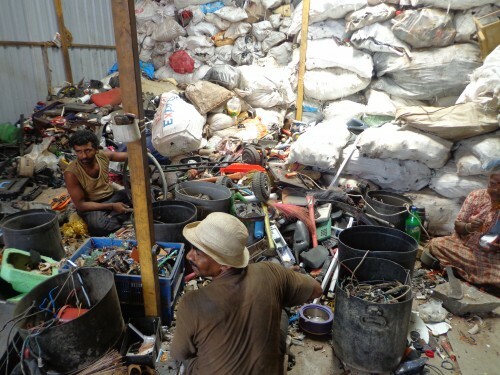 Ahmed Pasha and his colleagues are keenly aware of the political and economic processes that delegitimize waste work. For example, a recurring problem faced by godown operators is with tax personnel who seize unsorted waste, fining godown operators upwards of Rs. 1000 when they cannot produce a bill of purchase. That is in addition to the regular bribes one pays to the police for not having professional identification. “In our old neighborhood,” states Ahmed Pasha, “we didn’t feel so much like outsiders.Here, we need licenses to appear legitimate”. In a strange twist of fate, recyclates generate much value for public coffers even in their criminalized form. Waste, to paraphrase theorist Michael Thompson (Thompson 1979), is never simply ‘dead weight’; rather, it is that in-between space that allows for one form of value to disintegrate and a new form to be born. Read the complete article in wastenarratives.com. The post here is a part of the Notes from Nayandahalli , a series and is a reflection of an ongoing study supported by Indian Institute for Human Settlements. You can find the previous post here.